The Convention defines land-locked states as those states which have no sea-coast. These states are at a definite disadvantage in comparison with those states which have their own coast and consequent access to their own ports and the sea for transportation. But they have the right to sail vessels flying their flag on the high seas, and they are free to carry on activities on the high seas, enjoying equal rights with all other states. Furthermore, land-locked states are barred from claiming parts of the sea for the benefit of the state. They do have a rather weak right to participate in the living resources of the exclusive economic zone of coastal states of the same subregion or region. However, even this right is limited to developing land-locked states when the harvesting capacity of a coastal state approaches a point which would enable it to harvest the entire allowable catch. Preferential treatment is granted developing land-locked states with regard to activities in the Area. All land-locked states are denied rights for participation in sea-bed activities on the continental shelf or in the exclusive economic zone of other states, but they must be given the opportunity to participate in marine scientific research in these zones of neighboring coastal states. As far as their use of the ocean in any way is concerned, land-locked states are at the mercy of other states, especially neighbouring states with a coastline, willing to grant the land-locked states access to seaports under reasonable conditions. The Convention provides a minimum of protection for the interests of land-locked states by guaranteeing the right of access to and from the sea and freedom of transit as well as equal treatment of ships flying the flag of a land-locked state. Freedom of transit is ensured by provisions of the Convention which prohibit the levying by the transit state of customs duties, taxes, and other charges on traffic in transit or subjecting means of transport in transit to higher taxes or charges than those customary in the transit state; preferential treatment of certain nations is prohibited. Transit states are obligated to take all appropriate measures to avoid delays or other difficulties of a technical nature in transit, and in the event that such difficulties arise, the authorities responsible in the transit states and land-locked states concerned are to co-operate in eliminating such difficulties quickly. 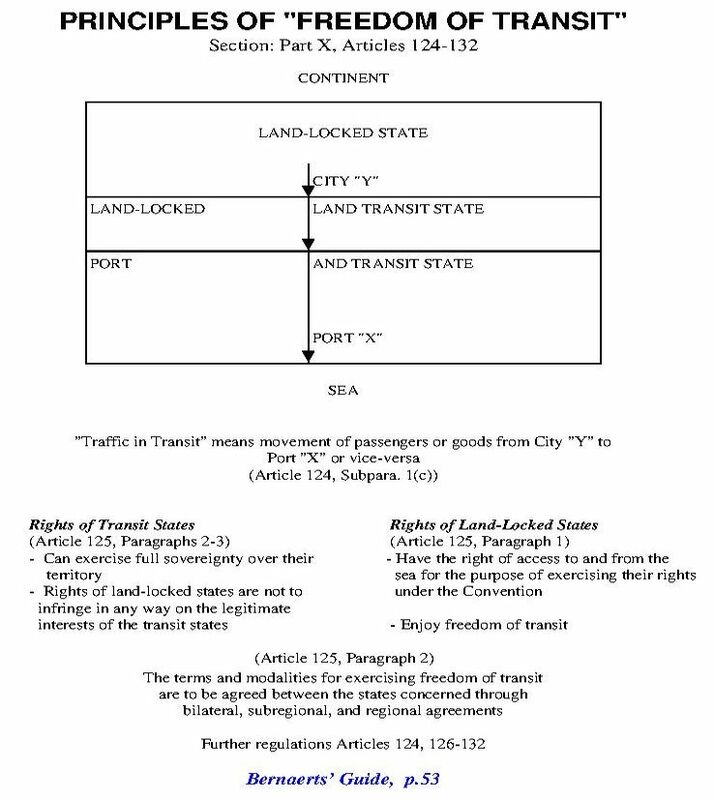 Naturally, these minimum requirements do not in any way preclude agreements between transit states and land-locked states providing facilities for the convenience of traffic in transit, co-operation in the construction and improvement of means of transport, or the granting of greater transit facilities, either now or in future, than those provided for by the Convention. In addition to the means of transport listed in the Convention (railway rolling stock, sea, lake and river craft, road vehicles, porters and pack animals), the states concerned may agree to include pipelines and gas lines as well as other means of transport. 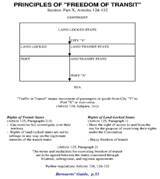 But all of the "rights of transit" mentioned above must be considered in light of the condition that the transit state exercises full sovereignty over its territory and may act to protect its "legitimate interests" as well as insist that agreements be made regarding terms and conditions for exercising the freedom of transit. More than 15 years ago FAIRPLAY PUBLICATIONS Ltd, Coulsdon, Surrey, England, published the book "Bernaerts' Guide to the Law of the Sea - The 1982 United Nations Convention". The guiding potential of the book to find access to the Law of the Sea Convention is still given. Internet technology and publishing on demand invite to provide the interested reader and researcher with this tool again. 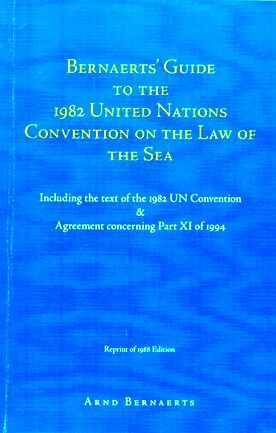 Only the Status of the Convention (ratification etc) has been updated and instead of the Final Act, the book edition includes the "Agreement relating to the Implementation of Part XI of the United Nations Convention of the Law of the Sea" of 1994. The corresponding web site neither includes the text of the 1982 Convention, nor the Agreement of 1994. The thorough Index of the 1988 edition is reproduced without changes. ___"an invaluable guide to the understanding and implementation of the 1982 United Nations Convention on the Law of the Sea"
__"the (book's) concept, which is so wonderful simple, is exactly the factor which makes the book so useful for both the novice as well as the person with extensive experience"
__"this is probably the best edition on the Convention to put into the hands of students"
__"it will be an invaluable reference tool and should sit on the book shelves of policy makers and all others who are involved in maritime matters"
Revolutionary changes have taken place in the International Law of the Sea since 1945. The process of change was accelerated in the last two decades by the convening in 1973 of the Third United Nations Conference on the Law of the Sea. The protracted negotiations, spanning over a decade, culminated in the adoption of the United Nations Convention on the Law of the Sea in 1982. By 9 December 1984, the closing date for signature, 159 signatures were appended to the Convention, the largest number for any such multilateral instrument in the history of international relations. The Convention, which was adopted as a comprehensive package, introduced a new equity in the relationship among states with respect to the uses of the ocean and the allocation of its resources. It deals, inter alia, with sovereignty and jurisdiction of states, navigation and marine transport, over flight of aircraft, marine pollution, marine scientific research, marine technology, conservation and exploitation of marine living resources, the development and-exploitation of marine non-living resources in national and international areas, and unique provisions dealing with the settlement of disputes concerning the interpretation and application of the new regime. There is no doubt that as we approach the 21st century, more and more attention will be paid to the uses of the oceans and the development of their resources. It is important, therefore, that these developments should take place within a widely accepted legal framework so that there is certainty as to the rights and obligations of all states. The United Nations Convention on the Law of the Sea provides that framework. It establishes a standard for the conduct of states in maritime matters. It is thus a major instrument for preventing conflicts among states. The convention and its annexes contain over 400 articles. For many it may be a formidable undertaking to grasp the substance and structure of it without making a considerable investment in time and energy. Mr Bernaerts' guide, therefore, is a welcome addition to the growing body of literature on the convention. It provides a most useful reference tool which will benefit administrators and policy makers, as well as scholars. It makes the convention accessible to the uninitiated and refreshes, at a glance, the memories of the initiated. With meticulous references and graphic presentations of the provisions of the convention, Mr Bernaerts has given to the international community an invaluable guide to the understanding and implementation of the 1982 United Nations Convention on the Law of the Sea. The reader will be aware that the 1982 United Nations Convention on the Law of the Sea is the first constitution of the oceans, a ground-breaking document in many respects. He or she might also have made the discovery that the full text of the Convention is immediately accessible only to experts. If the Convention were only a treaty consisting of straightforward technical regulatory provisions, it could be left to them with a clear conscience. But the Convention is to a large extent a political document and, as such, is expected to influence significantly the development of relations among the states in the world community; for this reason, a wide-spread knowledge of the scope, goals, and regulatory framework of the Convention can only serve to further the aims of the document and would surely follow the intentions of the many men and women who made this Convention their life-work, such as Arvid Pardo (Malta), Hamilton Shirtey Amerasinghe (Sri Lanka), Tommy T. B. Koh (Singapore), and Satya N. Nandan (Fiji), to name only a few of the hundreds who worked on the preparation of this Convention. As the reader uses the Guide (Part II), he will find that many provisions of the Convention are much easier to understand if one knows the basic framework within which a particular regulation is placed. The Guide aims to provide this framework, with reference to the text of the Convention and, in addition, t& the supporting Commentary of Part III, which describes the overall context of the major terms arid concepts. The Introduction of Part I sketches the historical background of the Convention and some of the general effects. A detailed index at the end of the book will be of assistance in finding specific subjects.